Introduction: When assessing the oral or hygienic status of a group, community, or population, different assessment systems are used to choose specific teeth and surfaces. A total numerical expression of the hygienic state is calculated and the digital index is called an oral hygiene index. The aim of the study is to describe the relationship between OHI-S and PBI-S in childhood. Material and Methods: Object of observation. The study is about the oral hygiene status of 60 children aged 6 years. Oral-Hygiene Index, OHI-S Greene and Vermillion (PI / 6 + CI / 6) - (Modified) is used to establish Oral Hygiene status. The research also includes the condition of the gingiva by evaluating the Papilla Bleeding Index (PBI-S) - Ainamo and Bay. Location of the study: University Medical Dental Center Varna, Faculty of Dental Medicine. After processing the results and determination of the highlights was conducted by actual survey data processing package for mathematical and statistical analysis SPSS v 20.0. Results: Comparison of OHI-S results according to PBI showed the presence of a statistically significant difference (F = 34.63; p < 0.001), with a tendency for OHI-S to increase with an increase in the percentage of PBI-S. In examining the relationship between OHI-S and PBI, an extremely strong direct correlation was found (r = 0.923; p < 0.001). Conclusion: 1. PBI correlation analysis of OHI-S results showed a statistically significant difference. 2. The average value of OHI-S increases with an increase in the percentage of PBI-S. According to Juke Ainamo, 1992, the system of periodontal indexes of the last 50 years provides us with the opportunity to improve the understanding of the second most relevant group of oral diseases or periodontal diseases. Since the early 1940s there have been epidemiological studies on the prevalence and severity of periodontal disease. The evaluation of the oral hygiene status of the individual is obtained from the visual coloration of the dental plaque biofilm. When assessing the oral or hygienic status of a group, community, or population, different assessment systems are used to choose specific teeth and surfaces. A total numeric expression of the hygienic state is calculated and the digital index is called an oral hygienic index . Gingival condition assessment is determined by its color, humidity, interdental papillary state, gingival edge, consistency, gingival surface, width of the attached gingiva, and the diagnosis of oral mucosal lesions. Some authors such as Sebastian G. Ciancio (1986) and Stanley P. (1974) believe that the indicators show the correlation between the various criteria used and histological signs of inflammation, especially in the case of bleeding and symptoms of bleeding inflammation [2, 3]. Stuart L. Fischman and Peters BM et al. reported that the indices were chosen to assess the patient's oral hygiene status. This assessment should be as objective and easy as possible [5, 8]. Kakar A et al. in 2014 reported that the Board of the American Dental Association of Dental Therapy adopts guidelines for the acceptance of chemotherapeutic products for the control of dental plaque and gingival Inflammation [9-11]. Charles C. H. et al., 2004 and Riep B.G. et al., 1999, conducted studies using the most extensively the dental plaque biofilm indexes (PI) and the Turesky index. Gingival inflammation is generally assessed using the Loe and Silness method . In these studies, however, the modified Lobene gingival index and the bleeding index reported by Caton and Poison were used. Initially, patients had complete oral hygiene studies on soft tissues. The gingival index of Loe-Silness (GI), Quigley-Hein plaque index (PI), Volpe-Manhold (CI), and Lobene index (SI) were reported. GI decreased by 14.0% and 18.2%, respectively, and the differences were statistically significant (p <0.001). PI reductions compared to the control and were not statistically [6,7]. According to Markant S. et al. 2001, Streptococcus mutans form a much larger part of the flora in the caries lesion whereas Streptococcus oralis, Streptococcus sanguis and Streptococcus gordonii form a much larger part of the microbial flora of the dental plaque biofilm and on the smooth, healthy teeth surfaces. The ratio of Actinomyces naeslundii and Actinomyces odontolyticus is significantly higher in dental plaque than in cavity caries lesion samples. Each species is genotypically heterogeneous and different genotypes are recovered from different carious teeth in the same patient- child . Kressirer CA et al., 2017 suggests that S. wiggsiae has many of the characteristics corresponding to its species and is associated only with tooth decay . On the other hand, Foxman B. et al. in 2016 prove that the members of the families also have generic genes. The environmental and microbial communities also have an influence on the formation of dental plaque. If there is such a strong effect of family influence on salivary microorganisms, family control will improve the detection of microbial colonies associated with dental caries etiology . In 1977, the World Health Organization (WHO)  proposed a new index CPITN, the Community Periodontal Index of Treatment Needs, and an assessment of the need for periodontal treatment of populations . Periodontal screening is an easy and fast method of detecting periodontal diseases. Clinical signs are assessed - the presence of bleeding (during with a probe), the presence of supra- and sub-gingival tartar and the presence of gingival pockets with a depth of 4 mm or more. In the United Kingdom, this index is applied clinically, such as Basic Periodontal Examination (BPE) , and in the USA as Periodontal Screening and Recording (PSR) . The aim of the study is to describe the relationship between OHI-S and PBI-S in childhood. Object of observation. The study is about the oral hygiene status of 60 children aged 6 years. Study period 2015-2016 years. Oral-Hygiene Index OHI-S Greene-Vermillion (PI / 6 + CI / 6), (Modified) is used to establish Oral Hygiene status. The research also includes the condition of the gingiva by evaluating the Papilla Bleeding Index (PBI-S) - Ainamo and Bay (simplified). We estimate the bleeding gingiva after probing in the gingival sulcus of the distal papilla of each tooth, which is a sign of inflammation. The index is generally representative after 2 years of age when all primary teeth have erupted, in order to avoid false-positive results with changes in the gingiva associated with the eruption (eruptive gingivitis). A periodontal probe is probed in the gingival sulcus of the distal papilla of each tooth. The probing is done vestibular in V and VII quadrant and orally (lingual) in the VI and VIII quadrant. After the probing, wait 10 seconds for each distal papilla examined. The intensity of bleeding is reported in 2 stages: 0- Missing bleeding during probing; 1- There is bleeding when probing. Results reading: PBI-S is calculated by dividing the sum of the ratings of all probing points by the number of papillas examined. The assessment codes and the PBI-S value in % are recorded in the medical cards of each patient (6 year old). Location of the study: University Medical Dental Center Varna, Faculty of Dental Medicine, Varna with the permission of the University Scientific Research Committee and informed consent signed by each parent. The research is retrospective. Data analyzed in this study are taken from ambulatory journals and patients’ medical cards. The researchers are specialists at Pediatric Dentistry. After processing the results and determination of the highlights was conducted by actual survey data processing package for mathematical and statistical analysis SPSS v 20.0. The results of the oral hygiene index survey of 60 children aged 6 years showed an OHI-S average value of 1.55 ± 0.70 (SD), with a minimum of 0.3 and a maximum of 3.0. Good oral hygiene status have 36.70% of the tested children, while 26.70% are bad. Papilla bleeding index (PBI-S) study showed an average of 4.55% ± 2.21%, with a minimum value of 0% and a maximum of 8%. 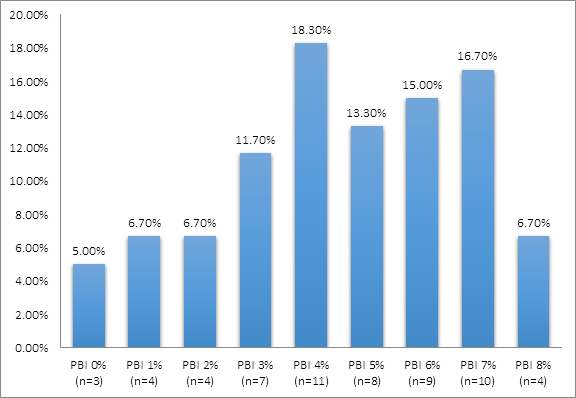 The highest relative share of children with PBI-S is 4% - 18.30%, with children with PBI-S from 5% to 7% having a total share of 45% of the sample (Figure 1). Figure 1: Distribution of children by PBI-S groups Comparative analysis of OHI-S results according to PBI-S showed the presence of a statistically significant difference (F = 34.63; p < 0.001). There is a tendency for OHI-S to increase with an increase in the percentage of PBI-S. 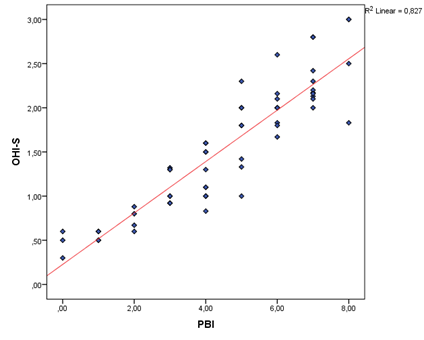 Figure 2: Correlation analysis between OHI-S and PBI-S The relationship between OHI-S and PBI-S revealed an extremely strong direct proportional relationship (r = 0.923; p < 0.001). 1. PBI correlation analysis of OHI-S results showed a statistically significant difference. 2. The average value of OHI-S increases with an increase in the percentage of PBI-S.
Juke Ainamo. Significance of epidemiologic research in the understanding of periodontal disease. European Journal of Oral Sciences 10 (1992): 39?46. Sebastian G. Ciancio. Current status of indices of gingivitis. Journal of Clinical Periodontology 13 (1986): 375?378. Stanley P. Hazen. Indices for the measurement of gingival inflammation in clinical studies of oral hygiene and periodontal disease. Journal of Periodontal Research 9 (1974): 61?69. Mike Benigeri, Jean-Marc Brodeur, Martin Payette, Anne Charbonneau, Amid I. Ismaïl. Community periodontal index of treatment needs and prevalence of periodontal conditions. Journal of Clinical Periodontology 27 (2000): 308?312. Stuart L. Fischman. Clinical index systems used to assess the efficacy of mouth-rinses on plaque and gingivitis. Journal of Clinical Periodontology 15 (1988): 506?510. Charles CH, Mostler KM, Bartels LL, Mankodi SM. Comparative antiplaque and antigingivitis effectiveness of a chlorhexidine and an essential oil mouthrinse: 6-month clinical trial. Journal of Clinical Periodontology 31 (2004): 878?884. Riep BG, Bernimoulin JP, Barnett ML. Comparative antiplaque effectiveness of an essential oil and an amine fluoride/stannous fluoride mouthrinse 26 (1999): 164?168. Peters BM, et al. Polymicrobial interactions: impact on pathogenesis and hyman disease. Clin Microbiol Rev 25 (2012): 193-213. Kakar A, et al. Evaluate the Efficacy of Different Concentratitions of Sodium Bicarbonate Toothpastes. IADR General Session and Exhibition, Cape Town, South Africa. Abstract (2014): 754. CDC Perio. Half of American Adults have Periodontal disease. 2016. GSK Firefish. Putting the patient first. Life of gum disease. 2016. Kabakchieva R, Nikolova-Varlinkova Kr. Child Oral Review. Card Completion Guide, Oral Status” and “Additional Research” from Child Dental Card. GERA ART LTD. Sofia 2013: 32-121. Marchant S, Brailsford SR, Twomey AC, Roberts GJ, Beighton D. The predominant microflora of nursing caries lesions. Caries Res 35 (2001): 397-406. Kressirer CA, Smith DJ, King WF, Dobeck JM, Starr JR, Tanner ACR. Scardovia wiggsiae and its potential role as a caries pathogen. J Oral Biosci 59 (2017): 135-141. Foxman B, Luo T, Srinivasan U, Ramadugu K, Wen A, et al. The effects of family, dentition, and dental caries on the salivary microbiome. Ann Epidemiol. 26 (2016): 348-354. Clerehugh V, Tugnait A, Chapple I.L. C. Periodontal management of children, adolescent and young adults. Quintessence publishing. London (2004). Clerehugh V, Tugnait A. Diagnosis and management of periodontal disease in children and adolescents. Periodontology 26 (2001): 146-168. Citation: Dobrinka Damyanova, Elena Dimova. Correlation Analysis Between OHI-S and PBI-S Ainamo and Bay in Children Aged 6 Years. Dental Research and Oral Health 1 (2018): 001-006.